Replace bridge over Norfolk Southern Rail Road on KY 842 (Richardson Road) (Kentucky Transportation Cabinet Item Number 06-1087.00). Provide sufficient width to accommodate the KY 842 widening recommendation in both the Boone and Kenton County Transportation Plans including multi-use paths. 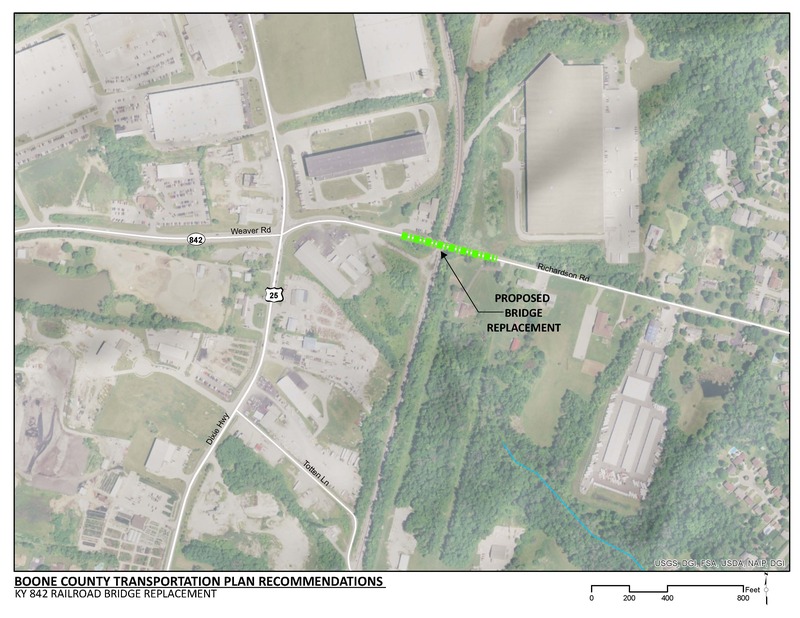 A new KY 842 bridge over the Norfolk Southern Railroad will provide sufficient width to accommodate the proposed KY 842 widening project and multi-use paths. A new bridge will provide remove load restrictions, decrease maintenance, and provide an overall safer structure. With the inclusion of multi-use paths, this project is consistent with Boone County’s overall goal of improved bicycle and pedestrian safety and connectivity. Click HERE for a map of multi-use paths in Boone County. Overhead utilities were identified along the north side of the roadway. The design of the new bridge over the Norfolk Southern Railroad should be coordinated with the proposed KY 842 widening projects in Boone and Kenton counties. Existing KY 842 is congested, however widening cannot be completed without improvements to the bridge structure. Commuters use this corridor as a key east/west connection between US 25 (Dixie Highway) in Boone County to KY 1303 in Kenton County. The Northern Kentucky Area Planning Commission projects 100 acres of commercial, 122 acres of industrial, and 100 acres of residential new developments immediately to the north and south of the KY 842 (Richardson Road) corridor. A variety of residential neighborhoods flank this project area and provide a range of housing options from single family on one acre lots to multi-family, rental properties with as many as ten units per cacre. Low income populations comprise 20 percent to 40 percent of the neighborhoods located along the northern side of this corridor. The Beechgrove Elementary School is located on KY 1303 in Kenton County, immediately south of the KY 842 intersection. The sufficiency rating of the existing timber bridge is 43 and classified as functionally obsolete. The bridge was closed in September of 2013. Repairs were made to the bridge and the bridge was re-opened. There is a 28-ton weight restriction on the bridge. TANK fixed bus route 28x travels along KY 842. There are no existing bicycle or pedestrian facilities located along KY 842. There are multi-use paths included in the KY 842 improvement recommended in the Kenton County Transportation Plan (OKI, 2014). The OKI Bike Route Guide recommends Richardson Road as a “preferred route” for bicyclists.